In my February 2014 report Left–Shift Technology Monitoring For Success In The Age Of The Customer, I explore what the near future will bring for technology monitoring approaches and solutions. Today, for the typical I&O organization, successful technology or service delivery monitoring focuses on two main areas. Firstly, availability, so ensuring the technology underpinning business services is up and available when needed. And secondly, performance, so making sure that technology utilized (applications and associated workloads) is fast enough for the business service it supports. There is a major problem with this approach though. As the famous author Harper Lee stated “We know all men are not created equal” and the same can be said about your customers and employees – they are not all equal and the rapid pace of consumer technology innovation in areas such as mobile means that they will utilize technology in different ways to support productivity or to engage with your enterprise as a customer. Our relationship with technology is changing rapidly. It is becoming more intimate and personal, meaning that datacenter centric monitoring approaches that focus on availability and performance alone, while still essential, are only the beginning of what is required for a holistic technology monitoring strategy. In the age of the customer, it’s increasingly easy for your customers and even employees to switch to another technology provider. They will do this if they feel their experience needs are not being met from the technology based services provided. 1. Does the technology based service meet needs? The technology monitoring market in recent years has evolved from a focus on infrastructure monitoring, to application monitoring and the emergence of End User Experience Monitoring/Management (EUEM). EUEM looks to understand technology based business service performance from an employee or increasingly a customer perspective. However, many methods that I see in the market today are still application-centric in their monitoring approach e.g. the operator configures monitoring based on specified applications. This means that many EUEM implementations fail to understand the full employee or customer journey. This includes how they use technology in in order to be productive within the enterprise or how they engage with enterprises, externally as customers. 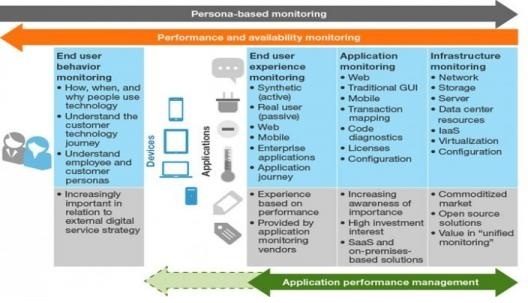 To understand the full technology interaction journey requires a more detailed form of end user monitoring which we define as End User Behavior Monitoring. End User Behavior Monitoring has the capability of monitoring all interactions or activity between employees/customers and the technology they use, i.e consumer devices and applications. The aim here is not to alert, but to build up a detailed understanding of how the various types of business users or personas interact with business services so as to ensure that experience is tailored appropriately. Of course, end user behavior monitoring may ring alarm bells in regards to data privacy, but as our relationship with technology becomes increasingly more personal then I expect some of these concerns to fade away along with associated legislation. If you are a Forrester client then my report highlights the concepts of End User Behavior Monitoring in detail. I also have an associated report coming out in Q2 2014 which looks at solutions on the market today which are capable of doing this form of monitoring within the enterprise. John Rakowski is Analyst, Infrastructure and Operations, at Forrester.